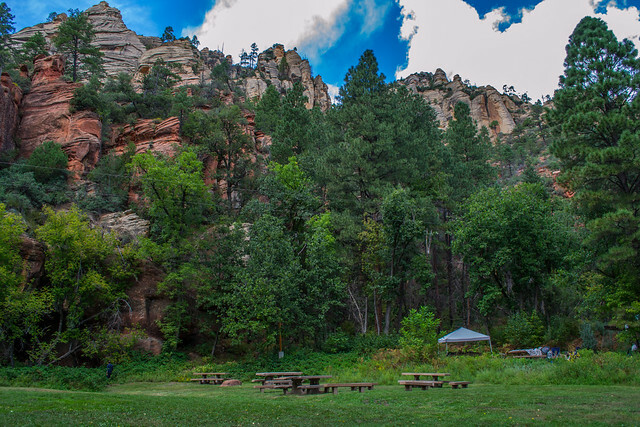 Cave Springs sits in the scenic Oak Creek Canyon and is one of Coconino National Forest's most popular campgrounds. The campground is nestled in a forested canyon near the town of Sedona, Arizona, and its famous red rock cliffs. The scenery is unmatched, the stream is stocked with trout, and swimming, hiking and birding spots are nearby. Natural Features: The area is a heavily wooded, lush riparian zone. Campsites are located in a shady stand of ponderosa pines in the upper reaches of the canyon. Many of the campsites are located right on the banks of Oak Creek. The creek has crystal clear, cool water that is refreshing on hot summer days. Recreation: There are several hiking trails in the vicinity. Some lead up the canyon slopes to offer good views of the surrounding scenery. The creek is bordered with paths that lead along its picturesque course, offering great bird watching and fishing. Facilities: Cave Spring is a large campground with 84 campsites, including one tent-only site. All sites have picnic tables, campfire rings and cooking grills. Coin-operated showers, drinking water and vault restrooms are provided for convenience. The facility can host RVs, trailers and motor homes up to 36-ft. Nearby Attractions: The nearest town is Sedona, popular for its red rock vistas, resorts and shopping. One of Arizona's best swimming spots, Slide Rock State Park, is down the road. Campers can also explore the 1.8-million acre Coconino National Forest, which boasts a spectacular variety of scenery and outdoor activities. Slide Rock State Park is only a short drive away. Fish Your National Forests: This site can be accessed by passenger car. Fish available include trout and native trout. Types of fishing available include wade, shore, fly, and spin. Tip: The best time to secure a campsite in a local Forest Service campground is between 8 a.m. and 11 a.m. on non-holiday Sundays, Mondays, Tuesdays, and Wednesdays. Reservations can be made by visiting Recreation.gov. Reservations must be made 3 days ahead of arrival and can be made up to 6 months in advance. Campsites are $22 per night. Access: On US Highway 89A, drive south about 14 miles from Flagstaff or north about 12 miles from Sedona. Cave Springs is a mile south (downstream) of Pine Flat Campground. Both campgrounds are located just off the paved highway to the west. Red Rock Country Maps: Download Red Rock Country trail maps and find other Sedona recreation resources. See the Oak Creek Canyon North map for this site. Paved roads and spurs. Vehicles up to 36'. Oak Creek is very crowded, especially on weekends. To get a campsite it is best to come on a weekday and come early. Fire Information Cooking grills and fire pits. No. of Sites 82 campsites. Reservation Info 21 of the campsites may be reserved. Call 1-877-444-6777 or visit Recreation.gov to make reservations. All sites have tables, fire pits, and cooking grills. For hand and dishwashing, not tank fill-up. No utility hookups. One vehicle plus a trailer. Additional vehicle requires an additional fee. RVs, trailers, and motor homes up to 36 feet. No utility hookups.